Sometimes, living in Dallas can have its hardships. Seafood costs an arm and a leg, it’s beyond hot here in the summer (and in the spring and in the fall and…) and for us single gals, we have to deal with a type of man called the “$30,000 A Year Millionaire” which means, sure, he drives a Porsche but he doesn’t have any furniture in his (tiny) apartment. Sometimes however, the geography gods smile on us and we’re rewarded for living here. Like being located in one of only 3 states lucky enough to have locations of the deliciously yummy and healthy restaurant Salata (don’t worry, more are coming!). If you’re not familiar with Salata, it’s a unique fast casual restaurant that specializes in healthy salads and wraps, 100% customized by YOU. How great does that sound?!? So, last week I was invited to bring myself and two friends down to Salata to participate in their latest promotion, Eat Light at Night, I jumped at the chance. Not surprisingly, I had ZERO difficulty in finding some willing tagalongs! Eat Light at Night is great initiative to get folks to eat a healthy, low calorie (500 cals or less), low carb dinner with the focus on lean protein and fresh fruits and veggies. Eating a light dinner has been shown to help aid in falling (and staying) asleep easier than after a heavier meal (except on Thanksgiving, of course) and studies have shown that eating a light dinner helps keep those extra pounds from creeping up on us, can I get an Amen? The nice folks at Salata have made it super easy to get a healthful, delicious dinner. You pick whether you want a salad or a wrap, choose your lettuce base (mine is the Salata mix + spinach), make some selections from the first round of add-ins, then from the second round, pick your dairy, your dressing and your protein and what sliced bread (if any) or flavor tortilla you’d like and voila! They mix all your goodies up perfectly and you’re done. I chose a wrap with some cilantro, black beans, corn, cukes, avocado, cilantro and their herb vinaigrette in a whole wheat tortilla and it was AMAZING. 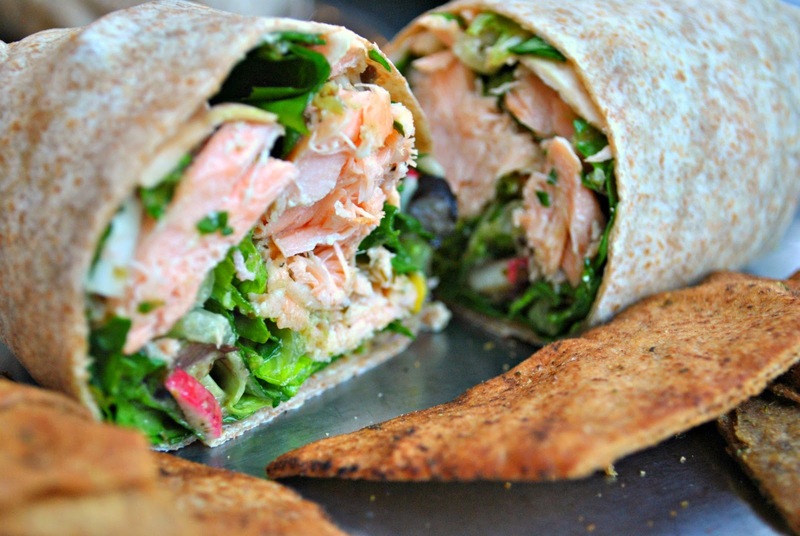 The tortillas are just thin enough to not overload the wrap with breadiness and the salmon was so flavorful and moist, it was like I baked it at home. Nothing felt mass-produced, which I really like. As for my friends, one had a salmon salad (loved it) and the other had a chicken wrap (also loved). Considering I had another salmon wrap for lunch today, I think it’s safe to say I’m a fan. Salata has also easy for you to become a fan as well. Eat Light at Night runs through October 20thand when you sign up for Salata’s free mobile club (just text “Salata” to 777111) you’ll receive special week-long discounts (like free protein upgrades and free add-ons) to your phone good for dining after 4 p.m. Also, just for signing up you’ll get a Buy One, Get One Free wrap and/or salad offer! Now, all these freebies will end when the ELAN promo does so HURRY! **Although I was compensated with food and beverage for my participation in this event, the opinions expressed here are 100% my own and 100% unbiased.